Geneforge 5: Overthrow is the final installment in Spiderweb Software’s Geneforge saga, a series of fantasy-themed role-playing games. The Geneforge saga features enriched story lines, open-ended gameplay, and multiple endings, but lacks graphical sophistication or a quality soundtrack. With Geneforge 5, the developers have crafted a strong ending note to the series, but the game’s main problem is also its main selling point: it looks and plays like a game released 15 years ago. The Geneforge saga revolves around the rise and fall of an extremely powerful race of magicians known as Shapers who have the power to create sentient beings to do their bidding. The earlier games in the series deal with the subsequent rebellion as some of the sentient beings were pissed off about the whole being-controlled-by-the-Shapers thing. Geneforge 5 allows you to play as part of the rebellion or an ally of the Shapers. Through your journey, you’ll work with different sects, go on quests, choose sides, as well as learn close-combat, magic, and creature-creating abilities. 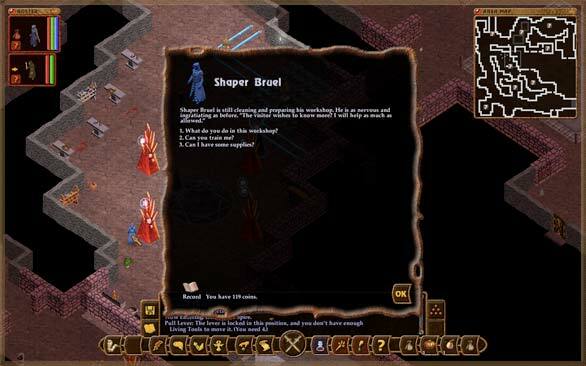 Geneforge 5 reminds me of Blizzard’s Diablo series, which divides characters into different class types, features a distant third person isometric perspective, and also tasks the character with hoarding lots of dropped loot in their pursuit of some goal. Of course, holding certain items will encumber you in combat, so you also have to choose what loot you grab carefully. Real-time adventure mode switches to turn-based combat mode when you encounter enemies, something that happens constantly unless you opt to avoid them. The combat uses a classic system involving items, spells, and creations as your tools of destruction. In a repetitive pattern, you’ll encounter the same poorly animated worms and troll-like creatures in the various dungeons you explore. The AI in the game is challenging and you'll want to quicksave often because you'll likely die several times the first time through an area. The game allows you to use diplomacy and stealth in certain situations, but as any RPG-fan will tell you, the easiest way to gain experience is to level up through combat and quests. That means you’ll get used to seeing that same firebolt animation hundreds of times in a given session playing Geneforge 5. Various maps let you see which of the dozens of areas you've visited in the game's progress, and a green outline denotes if you've cleared an area. The journal feature is also helpful to keep track of your quests, and the item, spell, and weapon menus are easy to use. Since the mythology of Geneforge is built around the magical Shapers, when selecting a class you’ll want to pick something that has strong shaping abilities. But the Shaper creatures aren’t particularly innovative in terms of gameplay—the pets that you create are similar to ones you’d find in other RPGs. So despite all the in-game text about evolving creatures and perfecting control, the shaped creatures look and feel worn. “Evolving” your creatures involves maxing out their stats as you gain experience, much like you would enhance your spells and weapons. Their appearance, actions, and use don’t alter save on a superficial level. Your “shaping” skills are limited to cookie-cutter creatures like dinosaurs and trolls, and then watch them change color as they get stronger. I’m new to the Geneforge series, and the story and gameplay took a while for me to get into, as my character kept on going in an out of amnesia and my guide didn’t speak in complete sentences (which was intended to convey she too was just waking up from control by the Shapers). There are multiple paths, sects, and ways to solve a problem and the lack of a linear plot may turn off some players. Simply, there are so many plots, subplots, and characters to keep track of that only dedicated RPG fans won’t be turned off. While the lack of graphical sophistication lends the game to an old school feel, the monotonous environments and unidentifiable characters make it hard to feel attachment to the world. There is plenty of text to get through to get the full experience, so the game feels sluggish coming out of the gates, but rewards players who stick with it. The game will take you many hours to play, and that’s only with one character. With nine classes, differing sects that open up different maps, and dozens of endings, the complete experience requires an investment not in hours, but days. You have to give Spiderweb credit—the Geneforge series goes toe-to-toe with bigger publishers and humbly, but adeptly delivers quality gameplay and story. At $28, it won’t cost you much to check out. The hint book costs an additional $7 through Spiderweb’s online store, which is quite helpful for some of the more difficult puzzles and if you want to learn how to unlock some of the different endings. Geneforge 5: Overthrow is definitely a niche game, and therefore hard to recommend to a wide audience. If you enjoy deep, long RPGs with a complex storyline and love old-school turn-based combat then Geneforge 5 will make you nostalgically satisfied, like watching an old 80s movie would. If you’re a casual gamer, not an RPG fan, or don’t have several days to invest to understanding the Shaper society, then you’ve probably stopped reading this review paragraphs ago. Editor's Note 1/5/09- Corrected number of classes listed. Clarified inventory comment.